One of my favorite reports to pull each month is the Year Over Year Home Sales Report. It is very simple, it compares the current month with the corresponding month from a year ago in order to see changes in the real estate market. Well, the Year Over Year Home Sales Report has been putting a smile on my face for nine straight months now! The following real estate graph shows the April 2013 Year Over Year Home Sales Report for the Tallahassee real estate market. It is important to note that all price ranges are lumped together, from starter homes to high end homes in Tallahassee. Tallahassee home sales in April were 39% higher than they were in April of last year. Moreover, every month for 9 months our market has moved higher than it had been in the prior year. 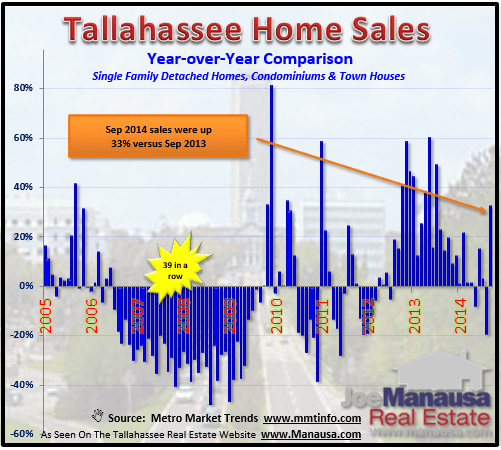 In fact, 12 of the past 13 months have shown gains in year over year home sales in Tallahassee. The strong run in the Year Over Year Home Sales Report began in August of 2012, and hopefully we will see it run on for many more months and years. Currently, there are still thousands of homes for sale in Tallahassee, as well as thousands more in the shadow inventory that need to be sold. The Tallahassee real estate market has been looking to the demand side for signs of improvement, and we clearly see these signs in the Year Over Year Home Sales Report above. This does not mean that we are "there," but the Tallahassee real estate market is clearly moving in the right direction. Increased buyer activity shows up on this report, so we will look to this report on a regular basis as a quick sign of the strengthening or weakening of the health of the housing market. If you are thinking about whether or not to sell a home in Tallahassee, this report says it should be getting easier for many of the price ranges. If you would like to know how the Year Over Year Home Sales Report affects you, for your particular home, just drop me a note and we can schedule a time to review your specific situation and goals.